Hampton Hardscapes Stone Masonry Contractors serve the Hamptons, the North and South Fork, and Long Island. Live the dream at home, Hamptons style, with uniquely designed walkways, patios, poolsides, pergolas, outdoor kitchens, driveways and entries, and stone veneer designs. See what our customers think! 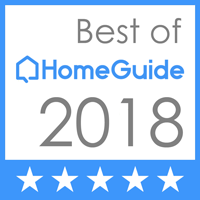 We're a five star rated Best of Home Guide service provider and a star-rated Thumbtack Professional vendor. Enjoy every minute of the season. From sun-filled decks and patios to fire pits for chilly nights, we can design the perfect space for your east end home. Curb appeal isn't just for TV shows. Our customized driveways can increase your vacation or year round home's value and leave a lasting impression. The possibilities are endless. Don't wait three seasons for a lackluster summer escape. Let us design and install your dream Hamptons style poolside oasis. The chef in your life will enjoy entertaining with a custom outdoor kitchen designed to suit your tastes. Enjoy the shade in style with pergolas constructed from the materials of your choice and transform your east end outdoor space into a European getaway. Does your home feel like its missing something? Stone veneer can enhance any space with its natural beauty and charm. Interested in finding out if Hampton Hardscapes can create your dream space?